Toyota is counting on gasoline-electric vehicles, led by an expanded Prius lineup, to aid its U.S. sales recovery in 2012 and to meet stricter fuel-economy rules. (Bloomberg) -- Toyota Motor Corp. said U.S. sales of Prius will revive with increased inventory and rising oil prices. Deliveries of the Prius, the top-selling hybrid since 1997, declined 9.4 percent through October from a year ago. Honda Motor Co.'s Insight fell 21 percent and Ford Motor Co.'s Fusion Hybrid sedan slid 48 percent in the same period, according to Autodata Corp.
"When Toyota is 70 percent of the market and we had to stop Prius production for almost 90 days, it should be no big shock to anybody that the overall hybrid sales volume dropped this year," said Jim Lentz, president of Toyota's U.S. sales unit. "It wasn't due to lack of demand. It was lack of supply." Sales of the fuel- saving vehicles have fluctuated with rising and falling gasoline prices. Demand surged when the average U.S. regular unleaded gasoline price reached a record $4.114 a gallon on July 17, 2008. Japan's earthquake and tsunami in March reduced supplies of automotive components. Before that, Toyota had sought a Prius sales record in 2011 with increased supply and more Prius-based models. The current average regular unleaded price is $3.38 a gallon, 17 percent more expensive than a year ago, according to AAA's Daily Fuel Gauge Report. It's likely to rise further going into 2012, Lentz said. "First quarter of next year I think we're going to see oil prices rise again, possibly a substantial increase," he said. "I think the Prius family is going to be in the right place at the right time." Oil prices fell below $100 a barrel last week, and oil futures slipped as much as 0.8 percent, the first weekly drop in seven weeks, on concern Europe's debt crisis will reduce demand. Toyota last month began U.S. sales of its Prius v, a wagon version larger than the main hatchback model. In early 2012, the company adds the Prius c, a subcompact version, and a plug-in model that goes about 15 miles per charge solely on electricity and operates like a standard Prius after that. Toyota said earlier this year it expects to sell at least 16,000 of the plug-in model in 2012. 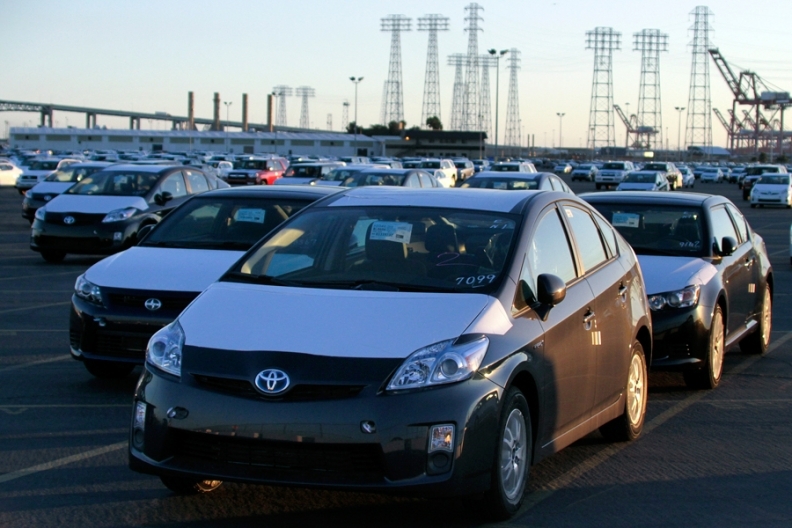 Sales of Prius models are "going to be much better in November and beyond," Lentz said. Increased advertising and promotion of the Prius line will drive more buyers to Toyota dealers, resulting in higher sales, he said. "People can talk about performance cars outpacing hybrids all they want," Lentz said. "It's not going to happen. We will see once again, very soon, when fuel prices rise, that hybrids will once again take off in the marketplace."